Life Before the Dinosaurs: Sanctacaris. 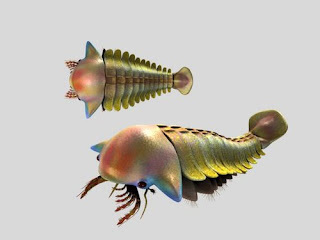 Sanctarcaris was a 4" predatory arthropod that hunted on the Cambrian sea floor of what is now the Burgess Shale. 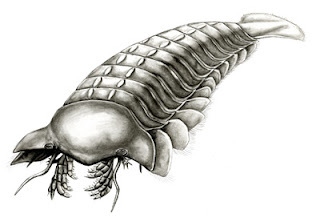 It fed on creatures such as Opabinia, Marrella, and trilobites. Sanctacaris had a wide, flattened head, ten finger-like limbs that forced food into its mouth, and a powerful tail called a telson. Sanctacaris, like other swimming arthropods of the Cambrian seas, had undulating fins along its side which helped it swim. They have long names because they're in Latin. Thanks for reading my blog, Spencer!!!!!!!!!! There's an interesting story behind the name of this one: the paleontologist who discovered it nicknamed it "Santa Claws". Its official Latin name means "Saintly Crab". The "sancta-" part and "Santa" are both from the Latin for "saint", and the word "-caris" of course shows up in the names of lots of other Burgess creatures. Cool blog, Art! I love prehistoric arthropods - researching them and drawing them! Sanctacaris ate Marella, huh? That makes Marella way smaller than I thought! Time to read more. I'm glad you like my blog. Marrella was usually about 1 cm long and Sanctacaris was about 10 cm long. So Sanctacaris probably predated upon Marrella. But no one knows for sure.